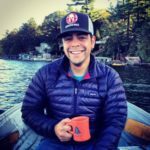 On the business side, if you’re in charge of running a healthcare practice, you may have thought about conducting a survey but since you have so many other responsibilities you may be wondering if it’s worth your time and effort and do you even know what you would do with the feedback that you get? Did you email an online form? Do you use an automated text messaging service to request survey participation? Do you use 3rd party survey software tools? Is mailing a hardcopy still effective? Do incentives actually work e.g. “Fill out our survey and you’ll be entered to win a gift card”? Are there any legal restrictions with survey incentives? In the responses below there are various takes on survey strategy and whether or not incentivizing people to take your survey is actually helpful or hurtful to the process. One of the key takeaways is that you should have a goal in mind before sending out your survey. “Companies that aren’t curious get comfortable in their shoes and don’t innovate. At GoPro we want to keep everyone curious, stay on the cutting edge and continue to innovate on products that are exciting for our customers. Our team is doing a lot of work to understand the voice of our customers, and we are curious about way more things that we can actually answer at a given time. That’s where SurveyMonkey comes in as a great tool for us to bring facts to the table. The insights that we are looking to get in our brand experience study are not only understanding our brand health, but also the potential. Surveys are sent out via email the following business day after a patient’s appointment. We’re able to do this through our EMR (electronic medical records) system that includes a simple letter and then a web link to the survey. Our custom Thank You page redirects participants to the sign-up form on our website for our weekly newsletter. Patient survey example from DLCC. 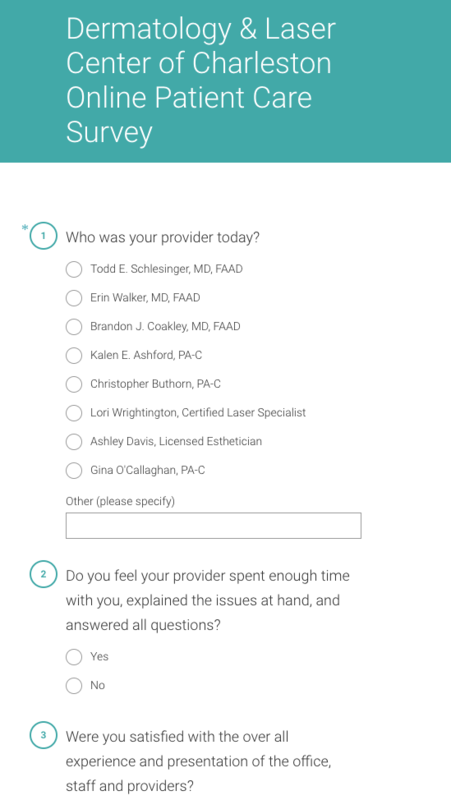 Click here for a patient survey example from The Dermatology and Laser Center of Charleston and read on to determine if implementing surveys is a good strategy for your practice. Are Patient Survey’s Worth Your Time? No one likes feeling taken advantage of or used. Incentives work because people feel like their time is being compensated and they are getting something in return. Whether it is in research or business, surveys are an ask. Surveys ask for someone’s time and effort. An incentive is a return on their investment and demonstrates an appreciation for that time and effort. It is a simple cost benefit analysis for individuals, and the benefit is an appreciation. Incentives don’t need to be an equal compensation for time and effort, but offering an incentive for something like answering a survey, when the individual otherwise receives no benefit, is more likely to succeed because it shows an appreciation for their effort. It has become increasingly challenging for marketers to get responses to their surveys as consumer and employee mailboxes and email boxes have become increasingly cluttered but surveying remains an important way to get insights from key audiences. Did you email an online form? Is mailing a hard copy still effective? It depends on your audience. If you’re surveying employees who generally work at a computer, email works well; if you’re surveying employees who are less likely to be at a computer, or have access to a mobile device, then hard copy might be a better option. In some cases you may wish to use a combination of both. Yes, this can be a good idea and a good way to send out “gentle” reminders to those who may not yet have responded. Be careful here, though. Some audiences become sensitive that a survey may not be “anonymous” if you’re able to identify that they haven’t responded. Yes – tools like Qualtrics (high end), SurveyMonkey (lower end) can be very useful in distributing and analyzing the results of surveys. Yes, traditionally experts have advised that incentives can help to boost response even something as simple as inserting a $1 bill into a hard copy survey. For most people, it’s just psychologically “difficult” to accept something of value (the incentive) without giving something in return (a response). Yes, but I’m not an attorney, so I’ll leave it to them to provide a response to this one. One final, very important, piece of advice: make sure you share the results of the survey with your respondents (and promising them, up front, that you will do so can help to boost response). Too often this is not done, generally as an oversight, but sometimes because the results may be negative and the organization doesn’t want people to know – guess what, they already know! Helps to manage expectations. For instance, if a small disgruntled group feels that their benefits are sub-par, but see that the majority of respondents rated benefits as “good” to “very good” they may rethink their own perspectives. 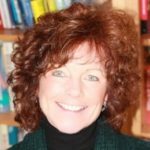 Linda Pophal is a marketing communication consultant and the owner of Strategic Communications, LLC, a firm that she launched in 2008. 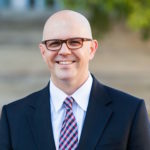 Prior to that, Pophal served for 10 years as the director of marketing communications for Mayo Clinic Health System-Eau Claire and served as an adjunct instructor in advertising and marketing at the University of Wisconsin-Eau Claire. Our company services the Urgent Medical Industry, Hospital Chains and individual Doctor Offices with incentivized rewards cards. These cards are used in many ways: to thank customer respondent who answered surveys, repeat patients earn extra reward miles or perks such as rapid intake and to track insurance, patient data and spending. Below are the answers to your questions and my contact information is below. I am glad to help provide accurate and credible information which may help your piece. No, as many do not like to use ‘data’ from their plans and sometimes surveys are lengthy or require more than 20 words to describe their responses. No. We find they do not allow tailoring of questions or posing examples of fact. No. Too expensive and for the most part the patient or consumer does not like snail mail. However, the senior citizens who are not computer savvy do take part in surveys when we insert a Rewards Card that requires an 800# to activate the rewards. When you add “entered to win a gift card” you can bet the responses will be terrible. Less than 1% will actually pay attention to this. We find that reward miles that can be transferred to airlines or dining cards is best. The transferring of points is easy and lower in cost than a $5.00 certificate. 100 reward miles can cost perhaps $0.20 and the vast majority respond well. Our internal data suggests than more than 88% follow survey rules and complete 100% of the questions asked. Yes, if the value of the reward or incentive is less than $2,500. The Card Act, a national US Law enters the picture. Any value under this is not required but some US States and European Countries do require registration by the gifting party for Consumer Complaint oversight. In the US, the CFPB (Consumer Financial Protection Bureau) is the governing body. Best Experiences: A dentistry group in 5 states merged to become one large organization. They tried direct mail advertising with very little impact. Paid for print ads in local news papers that resulted in very little “clip this ad’ for % off your first visit bill. They tried radio advertisements to no avail. AegisFS provided a reward and frequent recommendation card and structured point program. At first they used Social Media, Twitter and in-patient word of mouth. After the first 60 days they noticed increased visits. We assisted the dentist group by purchasing lists of wellness providers and recommendations by insurance companies with value added services. This worked very well and are not up to issuing 230 cards per month for new customers. To this point, this service is a driver to the merchant and does provide excellent data depicting: customer sales, services, where they spend money, average medial costs paid via insurance and cash out of pocket. It also provides outstanding one on one direct marketing to each customer as they must log in to utilize their card when making purchases on line or transferring points for travel or other perks. 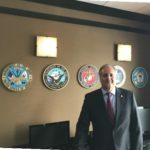 Jim Angleton is the president for Aegis FinServ Corp and am responding to your query as it relates to obtaining survey data and methods of data collection. Writing a survey is as much an art as it a science. Surveys can provide insight into the experience you are providing if done correctly. I would never send the survey in the email. I don’t because of potential to use skip patterns. This is a technique to allow different customers to get different questions depending on their answers to specific questions. I would not give a comment card or attach to a receipt. I have found that a thank you email with a survey link after the service has been provided works best. The survey should be written using a survey program like SurveyMonkey, Qualtrics or SurveyGizmo. It will make the survey look professional and will also make it easier to analyze the results. The customer wants to know that his time filling out the survey is valuable to you. For most consumer surveys, incentives are required. Giving everyone, a gift is best but it can be costly. Sweepstakes will increase the completion rate but some states do not allow sweepstakes and you need to provide details on how and when the drawing will occur. With a sweepstakes, you can expect 2-5% completion rate without any incentive it will be less than 1%. 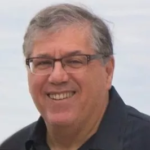 After more than 25 years in corporate market research, Neal Kreitman founded and is Senior Partner at ABN Partners. Aside from the data collection issues I think the most significant challenge here is in reassuring people (patients?) that their responses will be genuinely anonymous as people worry that if they provide negative feedback it could impact on the quality of treatment received. This is a real issue for people of all ages but probably more so for more mature people. So, if you’re looking for real insight as to where issues lie and what needs changing it’s probably worth thinking about how you provide reassurances and ensure anonymity. If you use 3rd party software and set it up as an online survey you can still send out or distribute hard copy questionnaires. As and when you get hard copies of the questionnaires back you can then enter the hard copy completions into the system so you have all the answers in one database which makes it much quicker and easier when it comes to analysis. 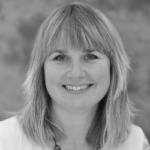 Jane Hales is Managing Partner at Sapio Research and has worked both client and agency side within market research, and is a qualitative specialist. Did you email an online form? Is mailing a hardcopy still effective? There’s no doubt we’re seeing better patient response levels by utilizing email and text messages, rather than mailing requests. This behavior has been seen across socio-economic demographics and healthcare specialties. The mail is good for something’s, but it’s not the best tool for generating patient feedback (especially if you want it to be portable). Yes, this is what we do, so obviously, we feel strongly that automating patient survey, rating requests is an important part in the success of a campaign. Everyone in a healthcare organization is already busy, so letting technology do the work helps ensure the program not only happens, but continues to happen long after it starts. Yes, we use our in-house tool RepCheckup. We’ve also used RepCheckup in conjunction with other tools such as BrightLocal, DemandForce and Text. Incentives do work, but they also may taint the results of the survey since incentives can skew perspective. Additionally, most third party rating and review websites prohibit the use of incentives in generating an online patient review. Yes, but I am not an attorney. I would avoid incentives all together (in lieu of educating patients on why their feedback is important). Now is the the time to start soliciting patient feedback and online reviews. The way in which patients find their providers of care is rapidly changing, putting patient feedback about care and their experience at the front of this new reality. As more an more patient go online and see ratings and stars before even stepping into your office, the more important surveying them and asking them to leave reviews will become. 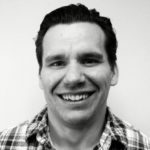 Garrett Smith, Owner and Founder of RepCheckup, a software tool that consistently generates new patient reviews and keeps a pulse on what’s being said about a doctor or practice. After the patient has left the healthcare practice, he or she will get an email or text asking them to rate their experience from a scale from 1 to 10. If the person rates 8 – 10, they will be prompted to an online review site to write a satisfactory review. Anything below a 5 will direct them to a text box, where they can write what went wrong with their experience and how the practice can improve. However, this will not get posted to the online review site, it will only be sent to the practice itself, allowing it to be dealt with in-house. Anything in between will not prompt them to anything, as they are just neutral. This only takes a couple of minutes at the, and people are actually more than willing to do it. And because unsatisfied patients are more likely to write a review, RepuGen is a way for the happy patients to write a review, while intercepting the negative ones. And those negative reviews can really hurt a business. 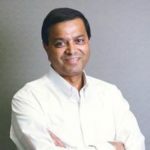 Ajay Prasad, Founder and President of RepuGen, a healthcare software that focuses on improving online reputation and patient experience. Meet your audience where they are and stay there. For example: if they are reading a print piece about your survey, have them fill out the survey on a print piece vs. directing them only to an online option. Have a plan to utilize the information and let the patient know why you are collecting the information and what you plan to do with the results and follow through. If your team is not seasoned in survey administration, management and data usage, consider utilizing a vendor who can provide those services. Ideal Sample Size: Typically, 300 respondents is the sweet spot to shoot for. This gives analysts a big enough base size to test for significance and to expect results to be more than directional. Survey Length: It’s more important to think about time than the number of questions. I council clients to think about the 2 or 3 things that they’d like to learn. It is best to craft surveys as tightly as possible to answer those things. Thoughts On Incentives: It is best to try surveying without incentives as it provides feedback from a better sampling of the audience, not only people who are motivated by incentives. For ongoing survey engagements or more complex surveys, incentives work well to drive response rates over time. 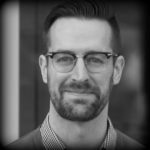 Dan Whitmyer, VP of Strategy at Northlich, over 10 years in varying roles in the marketing world: leading strategy, planning, measurement, relationship marketing, brand development, first-person consumer research, and business development. Are customer or patient surveys worth your time? Customer and patient surveys are absolutely worth the investment. Critical improvements often come from feedback from listening to the patient voice. Patients feel a sense of autonomy in being able to provide honest feedback about what are often sensitive issues. If the provider/physician makes improvements based on the patient’s feedback, it will not only increase loyalty from the patient who provided feedback, but also to those patients who did not leave feedback. Does incentivizing respondents help or hurt? Incentivizing patients to take a survey can be construed as manipulation. I would not recommend incentivizing patients to take surveys. Send the surveys as close to the time of care as possible. Be sure to follow up with patients who leave their name on the surveys and who wished to be contacted. Do not make the survey process difficult. Meet the customer on the devices they are on, which most likely is their mobile device. 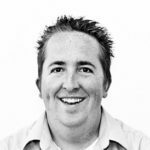 Aaron Clifford is Senior VP of Marketing at Binary Fountain, a provider of patient feedback management solutions with one of the largest repositories of online patient reviews and surveys in the healthcare industry. Without a strategy in place for how to act on survey feedback, the customer survey itself is meaningless. Having a strong plan of action—around marketing, customer service, facilities, or any other function of the practice—will help you be proactive with survey feedback, and ultimately avoid chasing unhelpful customer input. Alan Garcia is the CEO of Agreeable Research, a primary research platform focused on better understanding conversational boundaries. As one of the fastest growing provider review websites, CareDash receives reviews from many sources. Doctors utilize both email and follow-up mail letters to encourage patients to leave feedback on CareDash. One way doctors use the platform is as a reputation management tool and to reach more potential patients. According to our site’s analytics, physician profiles on CareDash with patient reviews see 4x more web traffic than profiles without any reviews and the overall average review score for doctors across the site is 4.3 out of 5. Reviews stemming from doctor follow up, either via email or mail, have proven to result in an average review score of 4.5 out of 5. In contrast, reviews that originate from organic searches average 3.6 out of 5. We believe that the lower score from organically generated ratings is due in large part to unhappy patients who purposefully use CareDash to voice concerns on a recent experience. Ted Chan has more than ten years of experience in management consulting and information technology solution architecture. 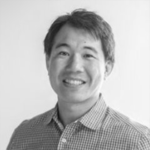 Chan is the Founder & Chief Executive Officer of CareDash, a resource for provider and patient reviews that makes doctor and hospital information more accessible, inclusive and transparent. What Do You Want to Do with the Information? What Are You Trying to Understand? Before you sit down to create that next online survey, think about what you want to do with the information. What are you trying to understand, why? What decision are you trying to make? Then as you’re creating your questionnaire, constantly check your progress against the information goals you set out to achieve. In addition, be sure to ask a few demographic questions so that you can segment responses to see differences between different age groups, genders or other characteristics. Lastly, be sure to be thoughtful about different types of responses from open-ends to multiple choice to multi-select. All of these will impact how the data comes back and your ability to analyze it. 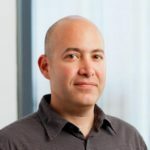 Adam Weinroth is the Chief Marketing Officer of eRelevance, a marketing automation service for small to medium-sized businesses. InboundMD sends out surveys to healthcare marketing clients to assess needs and how we’re performing. The feedback that we receive helps us not only serve them better but provides insight into how we can better attract new clients. We also work with our doctors to send out surveys to their patients to find out information such as how they’ve been referred to them (physician, friend or relative, social media) and what frequently asked questions their patients have. Immediate follow up is key to get answers in any survey scenario but for reputation management campaigns we deploy RepCheckup, an automated review software tool, for our clients to solicit patients with positive experiences to leave reviews on their review site pages such as Facebook, Google+, HealthGrades, Yelp, and more. We also use RepCheckup to monitor negative reviews, to give the practice a chance to respond privately, one on one with the patient, before the negative review becomes public. 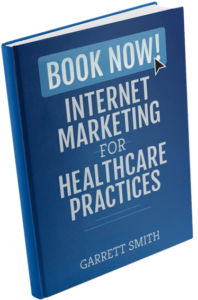 Practices with better ratings and reviews get more clicks to the their website and ultimately more patients scheduling appointments. Surveys and reputation management are very useful tools to learn how to improve your practice to keep existing patients happy and attract new patients. 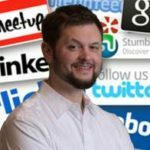 Nathan Miloszewski, Content Marketing Specialist at InboundMD, a marketing software service for healthcare practices that allows them to acquire patients, protect the practice’s professional reputation and engage patients online without having to be a marketing expert.